...And you should be as well. 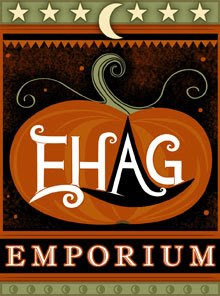 EHAG (Eclectic Halloween Artists Group) is announcing the grand opening of our online marketplace on January 31st at 9 PM EST. The EHAG Emporium will have over 20 EHAG artists tempting you with some wonderful one of kind works of art. Each artist will have one item for sale. There will be one image to tempt you with as well as contact information, shipping information, and a link to their blog for a more in depth look at that particular piece. Black Cat said people like lists and then handed me this list. He also stood beside me while I typed it out on the blog! He is gone now. "All of those exclamation marks," he said, "are very important, it helps to reinforce the information; it has got to do with psychology". Do visit our new blog site where the sales will occur. Mark you calendar to join us on January 31st, and all months that end in 31 except for New Year's Eve when everyone is out with Father Time celebrating their socks off.